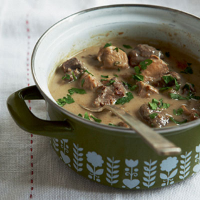 A winter casserole is the ultimate in comfort food, and this creamy game version with sage and cider is no exception - lovely on a winter's day. Tip the flour onto a plate and season. Coat the game casserole mix in the flour. Heat the oil in a medium flameproof casserole dish and add the game. Cook over a high heat, stirring frequently, until browned all over. You will have to do this in 2-3 batches. Return all the cooked game to the pan. Stir in the sage and cook for 1 minute, then stir in the stock and cider. Bring to the boil, then reduce the heat to a simmer. Cover and simmer for 45 minutes. Remove the casserole from the heat and stir in the crème fraîche. Serve with Waitrose Creamy Mash and seasonal vegetables. Garnish with finely chopped parsley. Instead of the creamy mash, you can serve with Waitrose Carrot and Parsnip Mash. Continue with the Waitrose Organic Vintage Cider! It has lovely ripe apple flavours that shine through the game and go perfectly with the mash.